Wait A Minute, This Game Isn't About Strippers! The streets are lined with shops and populated with otaku. This game's setting looks like Akihabara, and that's because it is. But where are the strippers? 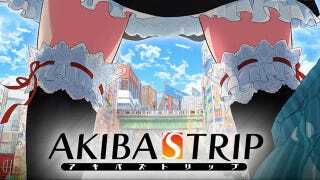 The game's title, Akiba's Trip, sounds like Akiba Strip in Japanese. No wonder the developers used photos of underwear strewn about Akihabara to promote the game. What Do These Boxer Shorts Mean? Akihabara is largely considered the geek mecca of Japan, something that's changed in recent years. The addition of a new train line that brought a flux of commuters as well as the area's commercialization cause some to turn their nose up at the area, preferring Nakano Broadway instead. Still, the name "Akihabara" alone conjures up images of maid cafes, used game retailers, arcades and otaku. Akiba's Trip looks to capitalize on that in. But with vampires, not strippers, apparently. Players can roam the area and battle with bloodsuckers. Games like this help cement Akihabara's place in geekdom, but they might not make the place feel as cutting edge as it once was. That pun, though? Brilliant. Akiba's Trip is headed to the PSP this April.